With the release of the latest starter box for Age of Sigmar I couldn't resist diving in. The box contains models that will help with both my Warhammer 40k and Age of Sigmar collections, so it just made sense. The real draw though was the excellent new character pieces that are included. 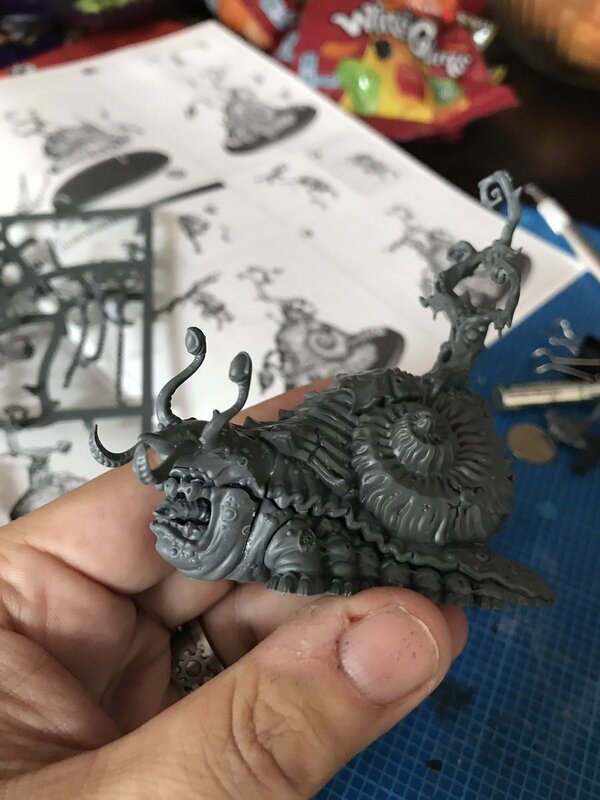 I just had to start with the brilliant Horticulous Slimux sculpt. 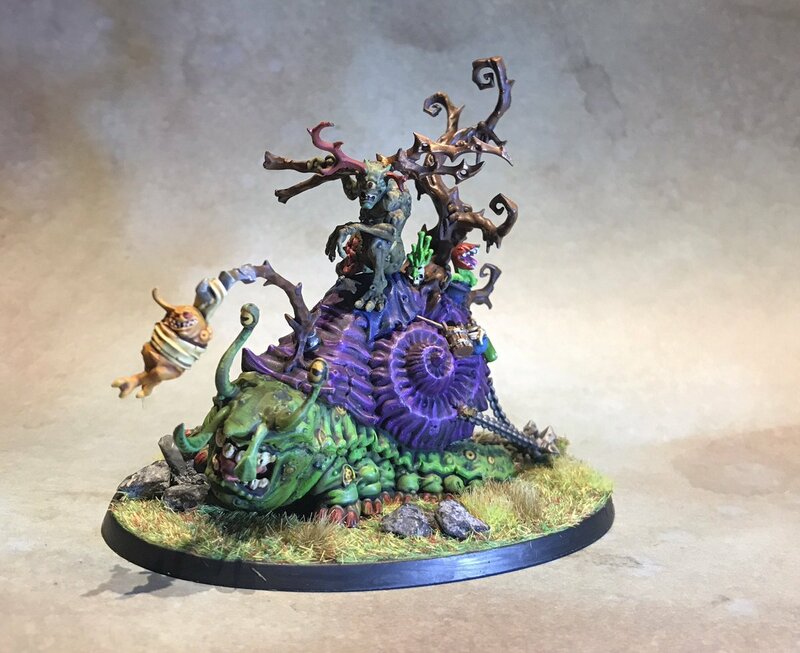 This guy has an absolute tonne of character, looking a little like something Tim Burton might have come up with if asked to create something for Games Workshop. The sculpt is great, and continues the trend of hiding cast lines brilliantly. It all fits together easily, and assembly was easy. 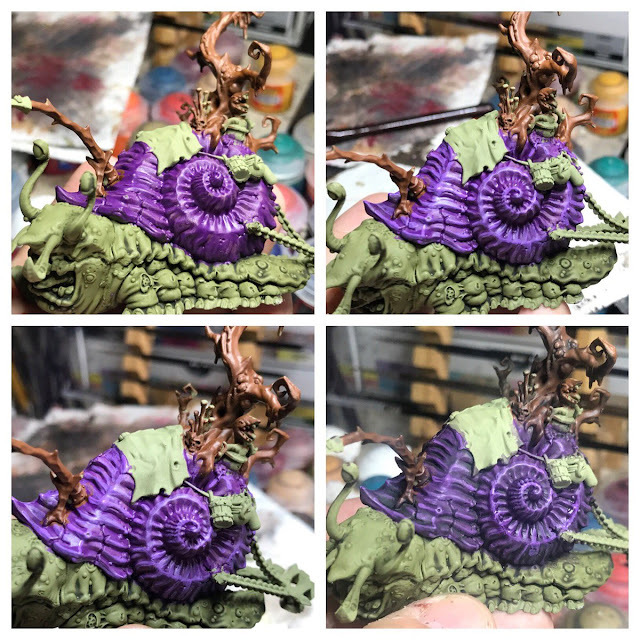 For the color scheme I stuck with the green and purple combo that had worked so well on my Poxwalkers. The shell is so well sculpted you want to find a scheme that ties the whole thing together and I think this one works well. I layered it up from a mix of Genestealer Purple and some of the pigment they released last year. I was trying to create something close to the old Warlock Purple from the previous range of paints. I think I got pretty close. Then I worked it with layers of thinned washes and finally highlighted it back up to Genestealer Purple for the edges. 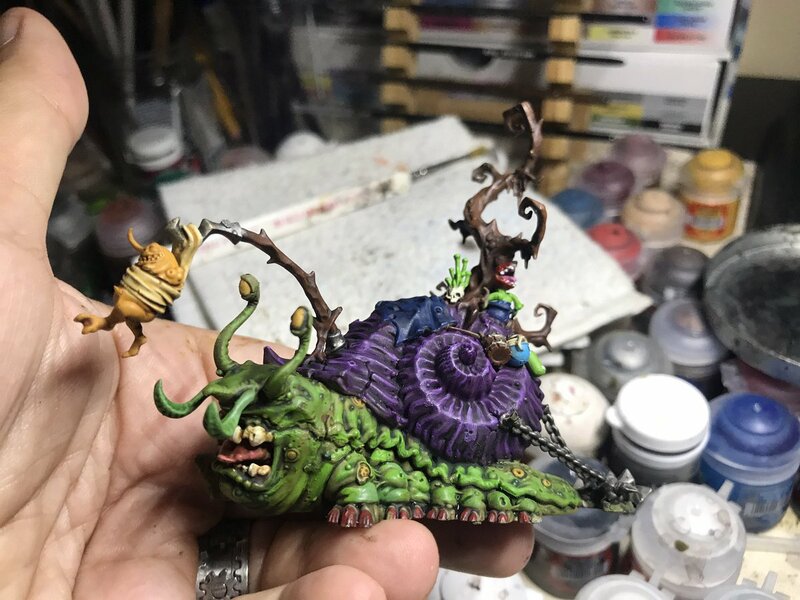 The snail himself was then done with a mix of bright greens while trying to texture it up and give it a grimy / slimy feel to it. I picked out the warts and details with yellow then blended them together with some Camoshade washes. I then went for bright primary colors for many of the detail pieces (and there are quite a few!). 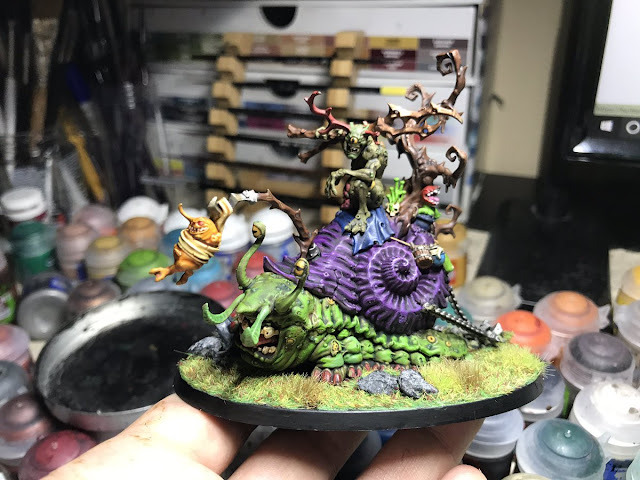 The bottles, the plant and fungus on the tree, the frog in the back, and then the saddle that Slimux himself sits on. All in all I was pretty happy with this one! Love the sculpt and feels like I did him some justice!